Perhaps the best female American shot putter didn't qualify for the Olympic finals, and that's a shame because not only does she hold the American indoor and outdoor records (65 feet, 3.75 inches and 66 feet, 2.5 inches, respectively), she wrote her master's thesis on the physics of shot putting, which means that she literally has heaving an 8.8 lb. amalgamated sphere into the air down to a science. Jillian Camarena-Williams has won 11 national shot put titles since 2005, and notched a third-place finish in last year's world championships, the best finish ever by an American, yet an inconvenient back injury kept her out of the shot putting finals in London. Since coming out of Stanford in 2004, Camarena-Williams has tweaked her style (moving from a gliding to a spinning approach) and also experimented throwing at different body weights, finally determining, she told Wired's Jeff Beckham, that she could throw farthest when she was at her heaviest, myopic conventions of female beauty be damned. When asked about her fluctuating weight, Camarena-Williams (who at 5'10 is on the shorter side of professional shot putters) explained that, after switching from her gliding throw to a rotational throw, she toyed around with dropping weight in order to build up some more rotational speed. "I ended up," she says, "having awful distances. My throwing just went in the tank. We were like, ‘Oh, crap. What's going on?' When I throw my best, I'm actually at my heaviest." So what difference does it make? Everyone's body is different, and sometimes there's very functional reason why someone is extremely skinny or burly. How we use our bodies — whether we're performing very specific, Olympian feats of strength or sitting at a computer ten hours a day so that inwardly sloping shoulders are the only way to make our sedentariness bearable — can determine how we look, and it's really no other body's business what you're doing with your own. Camarena-Williams added that misconceptions about women in her sport have contributed to totally false image of brutish, bear-like women who make a habit out of tearing everyone's phone books and challenging unsuspecting sailors to arm-wrestling contests. 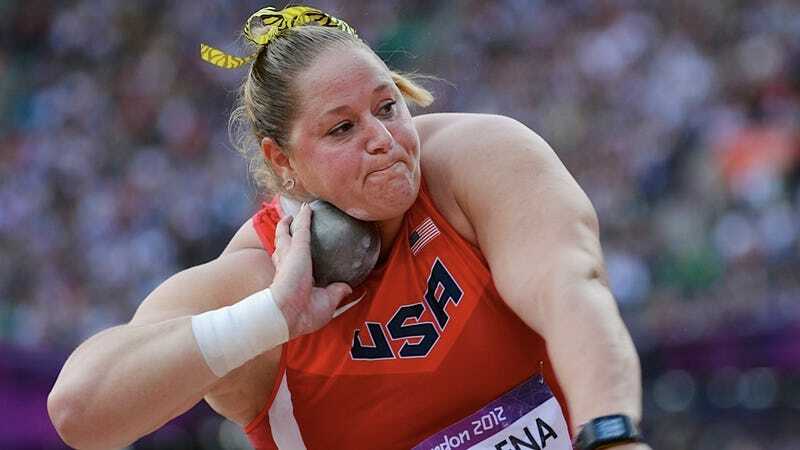 Obviously, shot putting requires flawless technique, what Camarena-Williams calls "finesse." She adds, "There's a lot more to [shot putting] than just beastly women." If there wasn't more to shot putting than simply picking up a heavy metal ball and throwing it far, then my good friend from JV track and field who tried to throw a shot put like a baseball would never have had a hilarious jaunt to the emergency room to repair his dislocated shoulder.